Home > COMET INDUSTRIES BELTS > COMET 300633C. Comet Industries CVT Belt. - SEE SUPERSEDED PART# > COMET 220315C, Comet Industries CVT belt > 38T4640 Gates KEVLAR reinforced drive belt. 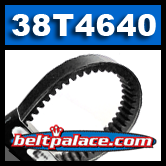 38T4640 Premium Gates™ KEVLAR® reinforced Snowmobile drive belt. Less than 4 in stock. Call for availability. 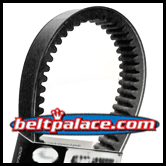 38T4640 Premium Gates™ KEVLAR® reinforced snowmobile drive belt. Gates Part# 98360017 Measures: 1-3/8" Wide, 46-1/2" Wide (35mm x 1181mm). Features Heat resistant fabric for smooth idling. Aramid Tensile Cords combine limited stretch with extraordinary strength and durability. Greatly outlasts “general purpose” hardware store brand snowmobile belts. Kevlar material and high-tech design provide long life, dependability and peak clutch efficiency. COMET 220315C, Comet Industries CVT belt replacement for Go Karts, Baja SAE karts, and UTV's.